Our CAT STATS Since April 2006. As a Community-Oriented 501(C)3 Private Organization in Green Valley AZ. Reduce community cat overpopulation (feral/stray/free-roaming) through Trap/Neuter/Return (TNR) in order to create a healthier environment for our communities. Educate the public on the importance of spay/neuter and health for companion animals. Rescue, foster, and re-home adoptable pets. 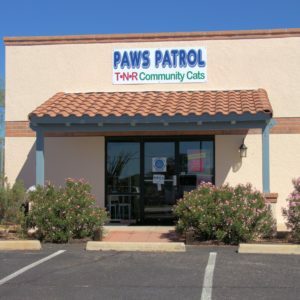 Paws Patrol began in early 2006 with a founding committee of seven qualified animal rescuers, each having at least several years of experience. All committee members had actively participated as volunteers, board members, and/or directors in other animal rescue groups.